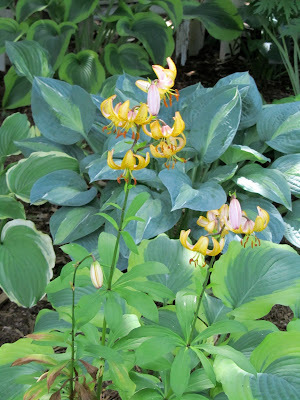 There are many people out there that think that the only plant that will grow in the shade are hostas. This could not be further from the truth. Most plants only require a few hours of sunlight a day to thrive and look gorgeous. So here are some wonderful plants to grow in the shade or use as companion plants to your hostas. Ligularia japonica - This is a wonderful, tall, airy plant for the back of shade garden. Not only does it have leaf interest, it also gets great yellow daisy-like flowers in late summer/fall. This one likes water, so do not plant it in dry shade. Martagon Lilies - martagon lilies work great in a woodland garden, since they tolerate shade. Arisaema (Jack-in-the-Pulpits) come in all different heights and colors. 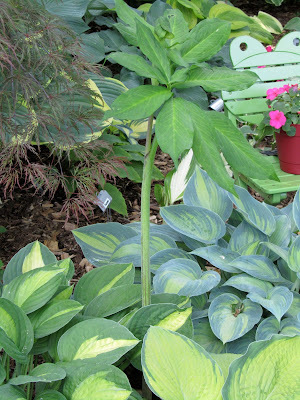 This one is Arisaema consanguineum, which can grow to be 3 feet tall. Trilliums add spring color to your garden. They also come in a variety of colors. On the left is Corydalis lutea, which slowly creeps in the garden. In the middle is Ligularia desdemona. 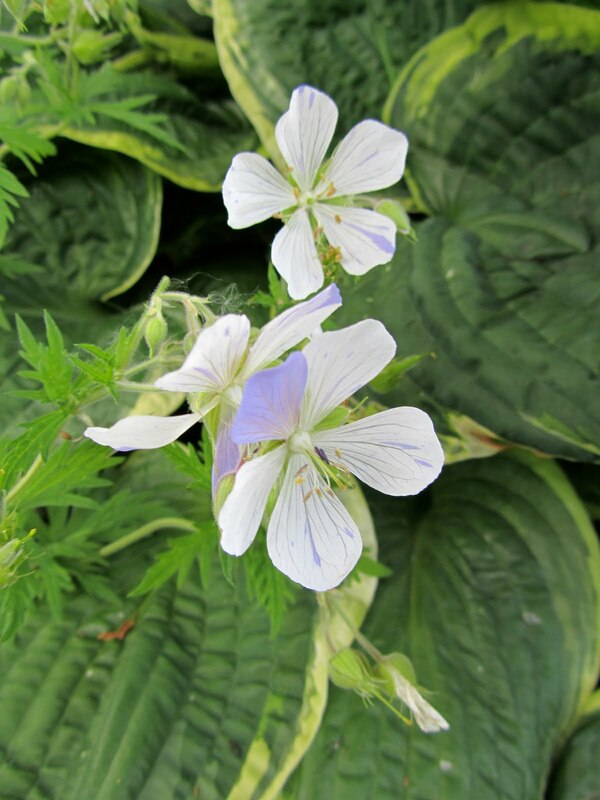 Hardy Geraniums - hardy geraniums come in various colors and leaf shapes. Some bloom early in spring, some late, and some will bloom intermittently throughout the summer. Violas - these can bloom from spring right through into fall. 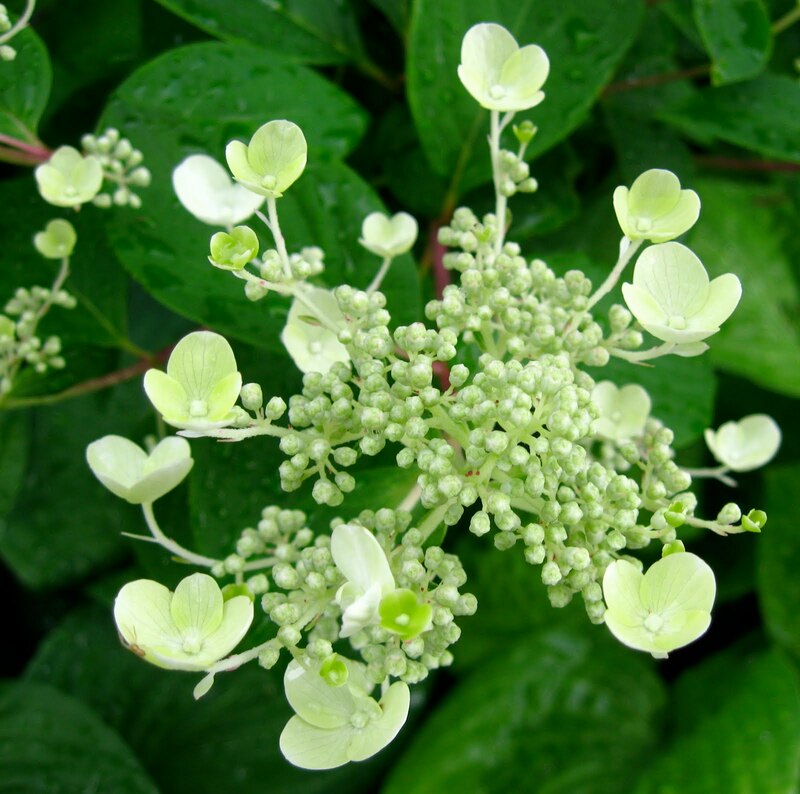 Hydrangeas - a great shrub for the shady garden. 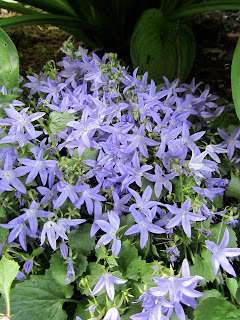 Campanula 'Blue Waterfall' adds a great blue color interest to the shady garden. Heucheras (coral bells) come in all colors and add great foliage color to your shade garden. Behind this one is a hardy geranium. Masterworts flower in mid to late spring, and even after their flowers die off they are still look beautiful. Primulas will grow in a moist, shady garden. I grow both Asiatic and Oriental lilies in my shade garden. As long as they receive a few hours of sun sometime during the day they will be fine. I like to put the new "miniature" or pot variety of lilies in my shade garden since they only grow to be about 16-20" tall. Epimediums flower in early spring. They have a great evergreen leaf that adds to the texture of the garden. These are only some of the plants you can grow in a shady garden! Wow...that is a really good list. i really like the ligularia. I have one that the leaves are very purplish. It has very dark yellow flowers that are simply stunning. Love your blog. These plants look like a peaceful and relaxing garden. Thanks! The flowers on the ligularia are stunning! In my dry shade garden, besides hostas, I've had success with most of these except for the ones that need extra attention to moisture (ligularia and primulas). 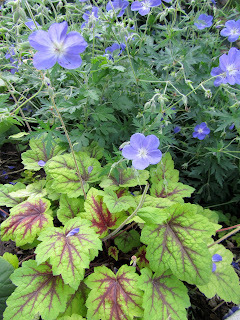 Very useful post b/c I'm always looking for shade plants; the beautiful pictures really help - thank you! Bugbane is wonderful, too. I really love it when it blooms in late summer. Cheesehead Gardening Episode 5 is here!